Stefan Oancia was born in 1923 in Stonehenge, Saskatchewan, Canada, one of the nine children of Demitru and Katie Oancia. The family had emigrated from Romania to Canada to take up grain farming. Stonehenge is a small community in the southern part of the province of Saskatchewan, near the American border and Oancia went to the local Twelve Mile Lake school. He joined the RCAF in 1941 and qualified as an observer. On arriving in England, he undertook further training and was then posted to an Operational Training Unit, where he teamed up with fellow Canadians Ken Brown and Grant McDonald, and two Englishmen Dudley Heal and Harry Hewstone. They were posted as a crew to Coastal Command for a few weeks to undertake anti-submarine sweeps. 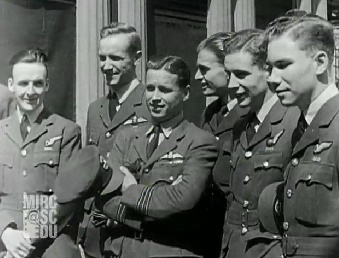 After final training on heavy bombers, Don Buntaine and Basil Feneron joined them, and the crew was posted to 44 Squadron. Just over a month later and after only six operations, they were sent to 617 Squadron. “I do not recall volunteering for this transfer,” he later remarked. Each bomb aimer on Operation Chastise made their own decision on what aiming device suited them best. Oancia was planning to get the correct dropping point for his mine from a set of chinagraph marks which he had made on his window to align with the towers on the dam. These were made redundant when they received a signal while in flight to proceed to the Sorpe Dam, which they had to attack by flying along its length. Like Johnny Johnson in AJ-T before him, Oancia had to call a number of dummy runs before Ken Brown hit on the idea of marking the approach to the dam with a line of flares. This succeeded, and at 0314 Oancia dropped the mine in the centre, and it rolled down the dam wall and exploded as planned. After what “seemed ages”, he recorded seeing a large waterspout silhouetted against the moon and falling slowly back into the lake. The crew noticed further crumbling to the surface of the dam wall, but no apparent breach. For his successful part in the operation, Oancia was awarded the DFM and travelled to London on 22 June to receive it at Buckingham Palace. He continued in Ken Brown’s crew after the raid until it was disbanded in March 1944, and served the rest of the war training other crews. He was commissioned in 1944. After the war, he returned to Canada and took a degree in civil engineering at the University of Alberta. One of the projects he worked on in later life was, ironically, a large dam in Quebec. He married Ruth Griffith in 1953, but they had no children. Stefan Oancia died in 1999. Thanks to Marianne Oancia Wyatt and Daniel Wyatt for help with this article. Blog post by his cousin, Daniel Wyatt. Very well done – Congratulations and so fitting on our Canada Day.